With major retailers closing, could this be the end of malls? Big stores, like Sears and JCPenney, are closing left and right. On Friday, GameStop announced it would close 150 of its stores. Earlier this month, Sears executives said the department store may not last through the year. Looking around now, you wouldn't be able to tell that the abandoned building and parking lot in North Randall used to be Randall Park Mall. And that back in the late 70s, it was the largest shopping center in the world. Sadly what's left is a vacant building and debris from construction. Retail experts say this will not be the last we'll see in what they're calling a Retail Renaissance. “Retailers have to recognize that nothing is perfect and nothing is permanent," said Richard Klein, Sales Expert & Professor at Cleveland State University. He said it’s what is fast becoming one of the biggest waves of retail closures in decades. “Baby boomers, the X generation, the centennials are all looking for bargains and they're looking for an informal atmosphere," Klein said. Part of the shift is the obvious reason — online sales. But he says other reasons are a bit more practical. “Discount department stores, cannot dispel them, the Walmarts, the Targets, play a big part. Kohls has played a tremendous part," he said. Randall Park Mall closed after sales went out and crime came in. The same thing happened with Rolling Acres Mall in Akron. And the impact was felt far beyond empty parking lots. 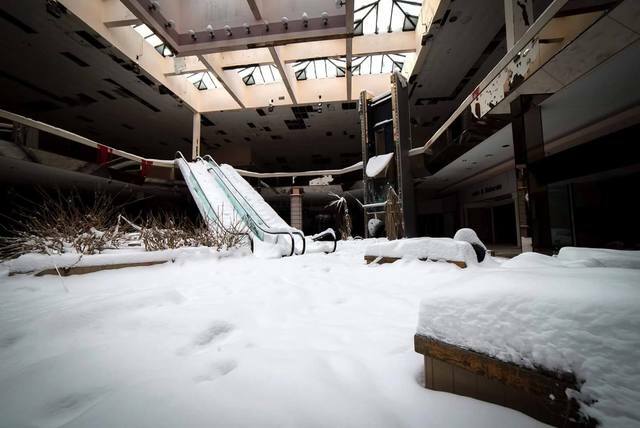 RELATED: What happens next with Rolling Acres Mall in Akron? "The second somebody leaves a community and goes to another community, their dollars go with them," Klein said. That's a scenario, Richmond Town Square Mall is trying to prevent. Sears in that Richmond Heights complex is closing now, and JCPenney will be soon. Business owners in the area are getting nervous. “We thought for sure this would be a great spot, 3 1/2 years later Macy's is gone, Sears is leaving, JCPenney's is leaving," said Elisabeth Sapell, Store Owner at the sweet shop All City Candy sitting right across the street from the Richmond Town Square Mall. She said the whole reason she moved in was because of hopeful mall traffic, now she's already seeing a decline. “We will definitely stagnate at some point with all the traffic being gone," she said. But Lisa Russell, who oversees the mall's operations and marketing, says neighbors have nothing to worry about. "That's one thing, you know, I really want to put to rest is that Richmond Town Square is not closing." That's not the case for what's happening nationally once these big stores like JCPenney and Sears duck out. “If one store, two stores, three stores, start to close and nothing replaces them, the retail sector, like any smart business community, looks around and says, 'what's going on here?'" said Klein. And the impact left on the community is great. Klein advises that mall owners get ahead of the trend, figuring out what other businesses or services can occupy the space before a big store like Macy's or Sears announces it will leave, so taxpayer dollars stay within that community.